Updated Tuesday January 29, 2019 by Barbara Allen. We are going to continue our “Jacket Little Sister” program this year. We would love to get our program involved with the young fans as much as we can!! Each young girl that is interested in being a “Little Sister”, can sign up on the link below and will get a “Big Sister” from the Jacket Softball Team! If a young lady has a favorite player, then they can state that in their form. We would like to have our players and program develop a relationship with these younger players, and be able to help them in any way that we can! We will have several events where the big and little sisters will get time together! 1. Meet and Greet #1- Saturday February 2nd 12:00-1:00. 5. AGSA/Little Sister night on March 22nd ,where all little sisters and AGSA players will be recognized!! They will be recognized during announcements for the Varsity game at 6:30. The girls DO NOT need to be playing in AGSA to participate, and they just need to be 8th grade or younger. There is no charge to be a little sister, unless they sign up for the first pitch of a home game ($25). If anyone is interested in throwing out the first pitch at any of our Home games in March or April, please let me know. Its $25 and they will receive a ball and Jacket Fan Gear. Just send me an email of any specific date(s) that you are interested, and the name of the person throwing the first pitch. Please send this email out to all local, younger softball players that may be interested in being a little sister of our program!! I will communicate throughout the year with activities we will have for the Little Sisters, I will use the sign up information to send out emails. Please contact me if you have any questions or ideas to maximize the relationship between our program and the young softball players in the community!! 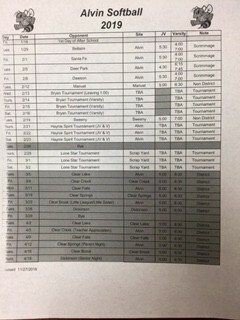 I have included our schedule, as well as the Haynie Tournament schedule we host. Sign Up to be a Jacket Little Sister!! Jacket Softball Little Sister Sign Up <---- Sign up here! !